Now it’s easier than ever to keep up with the news about Okinawa, as Japan Update web page has been powered up and optimized for smart phones and tablets. Current Okinawa news, articles, event listing, on-base movie schedules and much more is now easily available on your mobile device. Stories can be read by category, and articles can be shared on Facebook and Twitter. JU is also offering access to “Line,” the most powerful SNS application in Japan, and Instagram picture feeding application is there, too. Every one of those applications is accessible from JU mobile site. Contacting us also easier, as you can contact us by any application including FB, Twitter, Line, Instagram or inquiry category. Please feel free to let us hear your voice and opinions, or if you need more information on something related to Okinawa, just shoot us an inquiry. If you’d like to check articles from a PC browser, just click the PC icon on the mobile site. To switch back to mobile version, just click the mobile icon. JU is frequently offering free tickets to events, or special coupons by SNS application. Check us often to increase your chances to get those giveaways. We know information on all sorts of digital devices is increasing by bounds and leaps, but sometimes is nice to read sentences printed on paper? 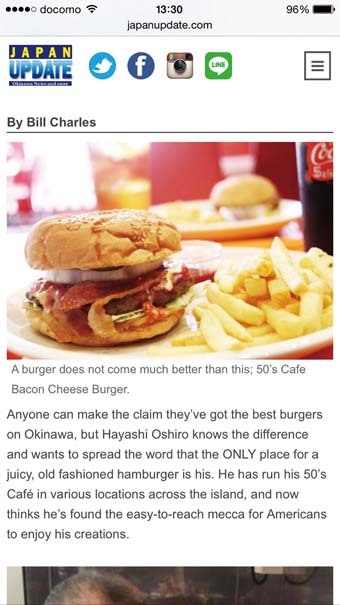 We understand that and will continue to publish up-to-date Okinawa information both ways, so you have a choice. Keep following information and news about Okinawa, stay abreast with local events by reading Japan Update. Our mobile address is the same as our JU homepage www.japanupdate.com.